I especially turned to books when I was taking my mom for all her doctors' appointments (before her eventual death in 1995). The books helped me keep what little bit of sanity I seemed to have intact. To be able to forget your worries, for even a few moments in time, can be so replenishing for the soul. I know what you mean, Laney. While romance novels bring me pleasure during happy times they have also been my salvation during the dark days that life sometimes hands us. Congratulations to Cathy on her new book and series. It looks like a good one. It is so true that I have read romances for years and they have cheered me up through so many things. I agree, Maureen! I love knowing that I can pick up a novel that will surround me with hope and a happy ending. I know what you mean, Laney4. Books always help me slip away when I have challenges and heavy responsibilities. It I can read, even for a half hour, I feel energized. There have been times when I thought I really should be "worrying" but I was better for the break. Laurie, I'm going to take a guess that you'll probably be the only person here today who says exercising makes her happy! lol! I love your list and, it's true, it really is the little things that can make us happiest. I like exercising! Me! My hand is up. Welcome, Cathy! Morning, All! I'm on my way out the door to run a few errands but I'll be back to play later this morning! Aloha, Cathy and THE ROMANCE DISH! I was very happy in Hawaii ... but I am also happy here in Maryland. The reason - I have learned to smell the roses and read romance books! Kim, I'm happy that you're finding happiness in Baltimore. I know how hard it was for you to leave Hawaii. Isn't it wonderful that our happy stories can travel with us wherever we go? Cathy, I really liked your post. It is evident that you find joy in reading and writing, and I enjoy the humor you put in your stories. I can't wait to read TBSN! Spending time with my husband, daughter, and my family makes me happy. Spending time with my parents makes me happy and sad because my dad has Alzheimers and he grows steadily worse. He was sad yesterday because he told my mother that he knows he should remember who she is, and she just gently tells him that she is his wife and it's okay. (58 years of marriage for them). I am going to visit them this weekend to make me happy and to help make my dad happy. Thank you for visiting TRD today. (((Deb))) I walked that Alzheimer's path with my step-mom. My thoughts and prayers go with you and your family as you navigate the ups and downs of this illness. Love the simple things in life. Faith,Family & Good Book! Work as a CNA & after stressful night love to unwind & get lost in a good book! Love your books so much! My 2 daughters make me happy. .. not all the time of course since they aren't saints....but they make me smile even on bad days. Ugh. That is an ugly url. Sorry! Thanks for cleaning me up, PJ. I'm a computer ninny. My kitties, my books and my family all make me happy. I'm a huge reader and book reviewer which I consider to be my "reward" for working so hard until I could retire. I could easily be a Crazy Cat Lady and absolutely adore cats. They're all so precious. Knowing my family and my friends are safe, happy and well rounds out my contentment with my life. I'm looking forward to reading "The Bride Says No," Cathy. It sounds like a great story and the cover simply makes me smile. Congratulations on the new release! 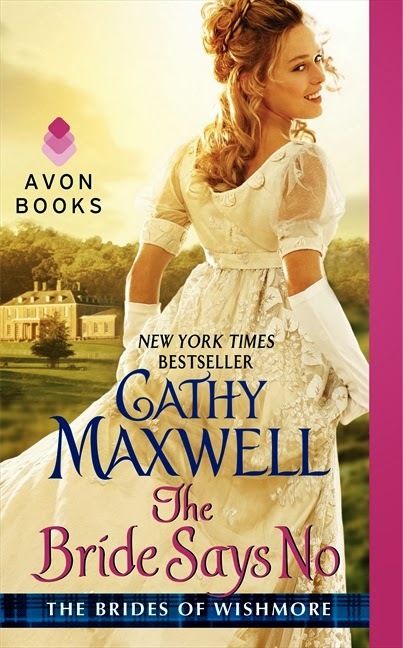 Cathy, I loved The Bride Says No, and I'm excited to have an eARC of The Bride Says Maybe in my TBR queue. The things that make me happy are too many to list, so I'll go with the things that make me happiest: time with family--especially with the grands; chats with friends, real and virtual; reading--or rereading--a good book; talking about books I love with other readers who love them too; and listening to music that touches my heart, stirs my imagination, and/or strums the "resonant chords of remembering." I would include writing, but I'd have to qualify it because writing sometimes makes me crazy. ". . . Writing sometimes makes me crazy." A romance book is a cheap form of stress relief. We need to make that into a FB card! LOVE this blog! Will be finding this book. Things that make me happy. Books, definitely; and art. Writing makes me happy, except when it doesn't *LOL* so I expanded this "necessary" to be art/creating in general. So whether I'm writing or painting or quilting or costuming or mosaicing or gardening, I'm putting myself into something and making something better, which makes me happy. Friends and family make me happy; cooking makes me happy (except when I'm too stressed to enjoy it or too busy)--but when I cook and enjoy it, I love it. So happy. Things in which I can put myself into and be accepted without judgment and that increases my well being in some way--those are the things that make me happy--friends, family, art, cooking, meditation...so I suppose "passion" makes me happy. Indulging my passions in a non-expectation way. Good point, cats lady. Historicals give us a nice veneer to watch the games men and women play. Sometimes the contemporaries can be too close to life. Yes books have been there when I needed them. It takes me away from my problems for a while! I love the cover of your book, its so pretty! I would love to read it. Avon always does an amazing job with the covers. This one and the cover for THE BRIDE SAYS MAYBE are two of my favorite of my books. I never would have believed that men too could enjoy romance novels until I started reading and editing my wife's stories. The range of emotions romance authors are able to elicit from printed words truly amazes me. I'm a guy, I'm not supposed to get teary eyed from reading a book. 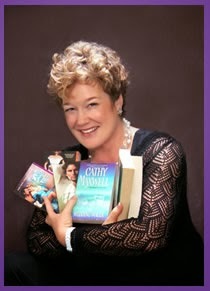 I'm so happy, Cathy, that you found your true calling and I look forward to reading your Brides of Wishmore series. Welcome to the dark side! Nope, said it wrong. Welcome to the FUN side HaggisBaron! "Where men and women take joy in each other." I like that slogan. Anyone else like that slogan for romance novels????? Where men and women take joy in each other." I like that slogan. Anyone else like that slogan for romance novels???? Hi, HaggisBaron! As Cathy said, welcome to the fun side! Hope you'll stop by to visit with us again. As others have noted, books can be a great stress reliever. When things are particularly difficult, a good books means a few hours to escape from life's worries. I think that's why I enjoy historical romance so much. I can lose myself in a world different from my own and leave worries behind for a few hours. Books have often helped me decompress from a stressful day - I'd much rather go to sleep thinking about a romance story than the trials & tribulations that keep popping up in real life! During my corporate years, I had a 45 - 60 minute bus ride to and from work. I loved spending that ride home in the evening reading romance. By the time I arrived home I had left the work stress behind and was ready to greet my family with a smile. Thanks for the chance to win your book. What makes me most happy is peace and quiet and my books. Cathy, I am so looking forward to reading:The Bride says No. I didn't read my first romance novel until the summer after my first year of law school. My husband and I were on our way to the Rockies to camp. It had been a particularly brutal summer for us and we were, in effect, escaping to the mountains. We stopped at a gas station on the way out of town and I, as usual, stopped at the book turn-style. I'd read all the male spy thrillers, all the mysteries and as many of the self-helps as I could take. I took a chance and bought my first romance novel. I read that bad-boy all the way through. When we got stuck in a sand storm in Omaha and couldn't even pitch our tent for the night, I read by flashlight in the back of the truck. I've been hooked on romance ever since. Love, laughter, light and getting through the seemingly insurmountable makes the journey worth while. That's why I read romance. It makes my life that much better. Wonderful article! What makes me happy…family, travel, community, all things Scottish, reading, great food and doing good work. Love, laughter, light and getting through the seemingly insurmountable makes the journey worth while. That's why I read romance. Thanks for stopping by, Janice and for sharing your thoughts. I love this: "They help me be "gutsy" and tough when I need to be, and they allow me to weep when I need to do that too." I agree with everyone who mentioned your wonderful cover, Cathy. I started smiling as soon as I saw it! I think the cover for these two books are absolutely some of the best I've ever seen. The Avon Art Dept out did themselves. I'm fortunate to be working with them. I use romance novels to lift my mood all of the time. If I am having trouble sleeping, I reach for book by an author that writes easy,happy romance, or even a book I have read before that gave me good memories. This invariably gets my mind off what my problems are & helps me sleep. Sharlene and Barbara--you are right. Books are "mood lifters." I think more than anything else, romances are a good distraction. The historicals, especially, have on most occasions, been educational. I am a history buff and find some authors give an interesting perspective and good information on times, places, people, and events. All the sub-genre have their own appeal. The kids driving me nuts: take off for the land of the fae or shifters. (Some days it doesn't seem like much of a change.) Life boring: grab a good romantic suspense or thriller. Heart pounding action, danger, suspense, and you are back in time to fix dinner, none the worse for the adventure. The rat race getting to you: take a trip into one of the many small town romances where the pace of life is slower even if life can be complicated. These side trips make me happy. There are times, even in the best of families, where we just want to get away from it all. Reading romance is an easy way to do that without upsetting the family or your life (except the house may not be as clean as it could be). Few of us can take a break to go to an expensive spa, but we can all buy a romance or check one out from the library. The escape of reading someone else's rocky road through life & love and eventual HEA helps us regain our balance. It gives us time to heal, sort things out, and for a few minutes forget there is a sink full of dirty dishes, clothes to be washed, kids to pick up, and a house to clean. As long as we don't live entirely in the fiction of the romance books and forget the real world and our responsibilities, it is a good way to relax, escape, enjoy, and stay happy. Congrats on the new book/series, Cathy! I can't wait to read it and the cover is gorgeous! Congratulations on your new series, Cathy!! I'm so excited that it's out, can't wait to read it! Besides books, I love collecting hockey cards/memorabilia. Sports are a huge passion of mine, hockey in particular, so ever since I was a kid and got my first set of cards, I've been collecting when I can. Opening a new pack is like starting a new book by one of my favorite authors, so much pleasure in it! Ada, I was raised in Kansas so hockey is a foreign sport to me. I was charmed by the idea of your card collecting. I wonder if they have cards for horse lovers???? I can't wait to start this new Bride series Cathy. Love your books. Congrats on this new release.A gorgeous Kilted Highlander makes me very happy. :) But until I find one I have to say nothing makes me happy and pulls all my attention better then a good Historical read. When my daughter was 8 and diagnosed with Bone Cancer it was those books that kept me sane whenever she slept. I was so involved in the characters story it took my mind off of my own worries. Thanks for being here today and the opportunity to win a print copy of The Bride Says No. I'm looking forward to catching up with THE BRIDE SAYS NO. So much makes me happy these days. Life seems to be humming along beautifully. Books and reading have been my solace many times over the years. Currently using romance novels to deal with my mom's health issues. She's constantly going to the hospital & even though I promised not to worry... I do. Been reading A LOT, sometimes it's not going smoothly. Other times like last night I give up sleep to finish the book :) Who was it again that said sleep is good but books are better? So true, absolutely loved The Marriage Ring Cathy & The Bride Says No sounds awesome too!!! Sorry to hear about your father Cathy, sending you a virtual hug!! All, I heard a talk the other day about what makes people happy. The speaker, Dan Buettner, said that Philanthropy triggers the same stimulus in us as sugar or crack cocaine (crazy to think those are linked together!) Anyway, I wonder if the satisfaction of enjoying a great read does the same thing? Just musing . . . While I adore my friends nothing makes me happier then the love I receive from my husband, sons and their families. My husband in particular is my rock and foundation. He somehow always knows when to push to get me to discover new things but also to pull me close and when sometimes a hug is all I need. He has sat by my side and comforted me thru good times and bad from cancer and heart surgery to the birth of each of our grandchildren. Some may say a good man is hard to find but sometimes you have to see beneath the exterior and you'll find the person inside is warm and loving. While others often think he's gruff inside there is a big teddy bear who loved watching and helping his children grow and nurtured them to go out into life and help others as well as treasuring their own families with love and devotion. What makes me happy is my family! Hi, Cathy! Being alive and well makes me happy. Romance books have gotten me through a lot of difficult times in my life -- hospital says and staying with my mom and husband as they were dying. They gave me something else to think about. Like so many other people, I use books to escape. And, what better place to escape that into a Historical Romance!! My husband and my grandchildren make me happy. My romances helped a lot in the early years of my marriage, when I was a stay-at-home mom with a husband who worked long hours. Cathy is amazing and I love her books. Never been to a Burns night.